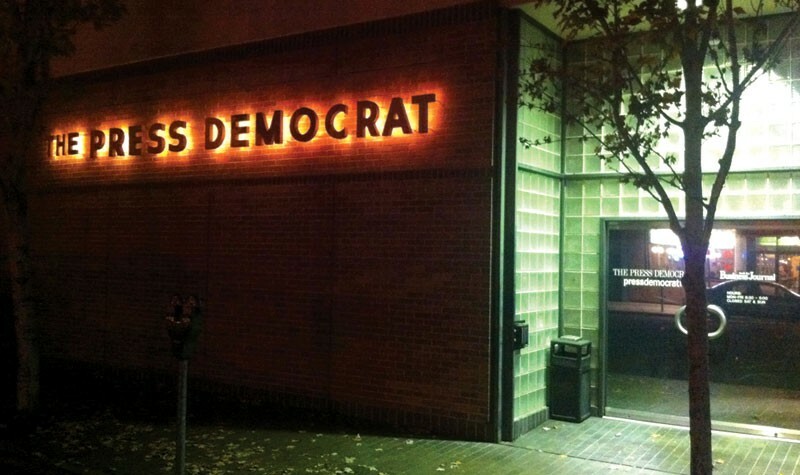 THE OTHER SHOE DROPS The Press Democrat is once again locally owned, with its owners' connections under scrutiny. The Press Democrat has been sold by Florida-based Halifax Media Group to a group of local investors, including lobbyist and developer Darius Anderson and former congressman Doug Bosco. The sale marks a return to local ownership for the 115-year-old newspaper. Halifax purchased the Press Democrat last year along with 15 other regional newspapers from the New York Times Company, which owned the daily since 1985. The announced sale, expected to close in the coming weeks, includes the Press Democrat, the Argus-Courier, the North Bay Business Journal and their websites. (Anderson's group, Sonoma Media Investments LLC, also bought the Sonoma Index-Tribune earlier this year.) No sale price has been disclosed. The group also includes Stephen Falk, a former publisher of the San Francisco Chronicle, and Bill Hooper, president of Kenwood Investments. The four men share intertwining histories. Anderson and Bosco have worked together since the 1980s, when Anderson interned in Bosco's congressional office. Anderson serves on the board of the San Francisco Chamber of Commerce, where Falk is chief executive. Kenwood Investments, led by Hooper, is Anderson's development firm. But it's the group's business interests, lobbying and political connections that have raised concern about the influence the ownership group could wield over the newsroom. The client list of Anderson's lobbying firm, Platinum Advisors, includes Clear Channel, Pfizer and Microsoft. Other clients include CVS, currently involved in a controversial development proposal in Sebastopol; PG&E, which has battled public power, an option that is currently being explored by Sonoma County; and Sutter Health, whose nurses recently striked in Santa Rosa. Anderson's lobbying firm also represents Station Casinos, partners with the Federated Indians of Graton Rancheria in building an Indian gaming casino in Rohnert Park. Anderson also has plans to build a $30 million hotel near the Sonoma plaza. In 2010, the Press Democrat's Ted Appel reported on a $500,000 settlement by Anderson's Gold Bridge Capital in a corruption probe that involved private equity firms managing public pension fund investments. Before that, Anderson sued a Kenwood neighbor for "emotional distress and loss of social reputation" after she called the police on a loud party at Anderson's estate, as reported by the Press Democrat's Paul Payne. Neither story was mentioned in the newspaper's reporting of its own sale or profiles of its new owners last week. Doug Bosco's involvement in the acquisition will likely face scrutiny from a worried environmentalist community. Longtime county environmental advocate Bill Kortum notes that Bosco was voted out of office largely for claiming he was against offshore oil drilling, but acting otherwise, at a time when urban growth boundaries and open space districts were being set to preserve the county's natural beauty. With Bosco as a co-owner of the newspaper, "he'd be in a position to break that will of the people," Kortum says. Bosco is also well-known as a behind-the-scenes heavyweight in Sonoma County politics, with interests connected to gravel mining and lumber. His close friend, Eric Koenigshofer, is the attorney for the Preservation Ranch project in Sonoma County, which would clear-cut 1,769 acres of second-growth redwood trees to develop 1,100 acres of vineyards. Bosco and Koenigshofer also help fund political candidates, including Fifth District Supervisor Efren Carrillo, who provided key votes to approve two contentious Bosco-supported projects: the Russian River gravel mine near Geyserville and the Dutra asphalt plant in Petaluma. Carrillo also helped approve the Fort Ross tasting room, a project opposed by neighbors but supported by Bosco. In the 1980s, Bosco, a self-described "conservative Democrat," was involved in both the Savings and Loan and congressional check-bouncing scandals. Now, with his wife, retired county judge and logging scion Gayle Guynup, Bosco often hosts political get-togethers in his McDonald Avenue home with donors and elected officials. To the San Francisco Chronicle last week, Falk expressed the new ownership's commitment to objective journalism at the Press Democrat. "Clearly, the ownership of this paper is not going to meddle in the journalism of this newspaper," he said. "Credibility is all any newspaper has, and we're not going to lose that." Reporters and editors at the Press Democrat contacted for this story were unwilling to go on the record but said that the independence of the newsroom is the goal of all parties involved. Newspapers owned by lobbyists remain rare, although that is shifting, says Kelly McBride, senior faculty in ethics at the Poynter Institute. "With papers being so cheap, we are seeing a lot of partisan owners scooping them up," she says of the Press Democrat's sale. "The San Diego Union-Tribune is another California paper that's experienced this phenomenon. Everyone wants to know if the owners will keep their hands off the editorial product and let it independently serve the audience. Only time will tell on that question." UPDATE: The ownership group also includes Sandy Weill, Norma Person, Jean Schulz and others; read more here.